Skyfall goes back to the beginning, to the rebirth of Skolia, showing how a chance meeting on a backwater planet forges a vast interstellar empire. Eldrinson, a provincial ruler on a primitive planet, is plagued by inner demons. But when he meets Roca, a beautiful and mysterious woman from the stars, he whisks her away to his mountain retreat, inadvertently starting a great interstellar war, and birthing the next generation of rulers for the Skolian Empire. 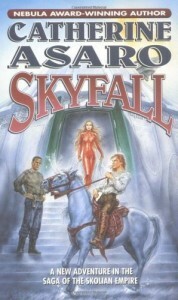 Skyfall is technically the ninth book in Catherine Asaro’s Saga of the Skolian Empire series, but is first if one is reading in internal chronological order. It works well as an entry point, though there were a few things that could’ve used a bit more explanation—presumably this happens in the books that were actually published before this one. Beautiful and golden (like, literally) Roca Skolia is a “Ruby Psion,” an extremely rare and valued psion descended from similarly rare parents who currently rule the Skolian Imperialate. Because of her pedigree, she is expected to marry someone of the ruling assembly’s choosing and produce more Ruby Psions, the only people capable of controlling “the Kyle web,” an instantaneous interstellar network that somehow protects Skolia. Roca’s been married twice before and her grown son, Kurj, has a lot of mental anguish about the death of his father, the abuse perpetrated by his stepfather, and the atrocities committed by another group of psions who relish the pain of others. When Roca’s away on government business (she’s the foreign affairs councillor), Kurj calls an assembly vote to discuss going to war with the sadistic psions. She knows he’ll try to stop her from casting her dissenting vote, so goes underground to try to make it back home in time without attracting his notice. Her route takes her to a remote, unspoiled world called Skyfall by “the Allieds” (descendents of Earth) and Lyshriol by its natives. There, her plans are foiled by a treacherous snow storm, and while she waits for it to pass, she falls in love with Eldri, a passionate and epileptic bard with significant psionic gifts, and ends up pregnant just in time for Eldri’s rival to lay siege to his castle. It wouldn’t be incorrect to label Skyfall as “a romance novel in space.” Certainly Roca’s relationship with Eldri, who believes she’s a gift from the sun gods and is otherwise baffled by the technology she sees as commonplace, is quite romantic, with the two of them drawn together pretty much instantly and conceiving easily when other Ruby Psion births have required much medical intervention to achieve. Roca’s position brings political factors into their relationship, however. It turns out that Lyshriol was once a Skolian colony, so when Kurj eventually comes looking for her and Roca’s family finds out she has actually married this “barbarian,” it is ultimately Eldri’s genes that convince them to accept him (after a barrage of tests during which Eldri’s mental abilities and illness are evaluated). There aren’t a whole lot of sci-fi elements to the novel, though there are enough to give one a picture of how things work in the Skolian Empire and its relationships with other spacefaring people. Genetic manipulation seems quite normal, as are cybernetic implants, and I am totally envious of the language node Roca has, which enables her to process and gradually learn new languages. Kurj has turned himself into an intimidating metallic giant, but it’s still not enough to shield him from his self-conflicting inner demons. In his case, Asaro effectively uses technology to show just how damaged he is, with some pretty fascinating results. Suffice it to say, I’m looking forward to reading more in this series! I’m apparently the only one who came into this having read one of the other books in the series (though not the one first published). My biggest point of confusion in the books I read was the family relationships — there were so many brothers and half-brothers and sisters and nephews and aunts, and I didn’t know who any of them were. Here, the Skolia family is a small and manageable size, so I felt like I was getting a handle on who everyone was and how they were related before the next generation (the baby) started to add more names to the list. Oh yeah, I had no problems whatsoever with the family relationships. It was more like… Why was everyone metallic-looking? Is a Trader different from an Aristo? My impression of the metallic looking is, it was just the fashion amongst their set. And that Trader is a more general term than Aristo, but some people use them interchangeably. I guess maybe Eldri’s people only had metallic-y hair, but Roca/Jarac/Kurj all had golden skin, too. I think Roca’s mother was fairly normal, at least of what I recall. Your review reminded me I had trouble with the term ‘psion’ and ‘psions’. Because I kept thinking it was a thing, not a person. Probably because it’s so close to ‘ion’. I kept getting pulled up short and having to think, sometimes two sentences later, ‘oh yea.. those are people’.